Most people associate concrete with grey, unpolished slabs. We know – it doesn’t look great. But concrete doesn’t have to look like that. 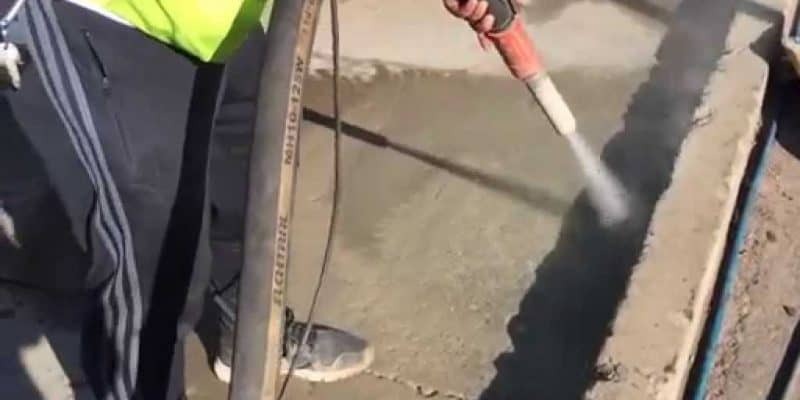 With the right tools, a skilled worker can polish concrete to a high sheen that looks incredible. Polished concrete is the perfect fit for a contemporary home or a business that values both beauty and practicality. Have you got bare unpolished floors? Forget carpets or wooden flooring, polishing is the cheapest way to transform that dull slab into something that looks great. The big benefit here is that you’ve already got the raw ingredients in place; upgrading what you’ve got is far quicker and more cost-efficient than trying to cover it up with something new. Concrete is tough, and polished concrete is even tougher. The sealers and densifiers added during the polishing process ensure that your polished concrete floor will last much longer than a carpet or wooden floor. Over the lifetime of your floor, you could potentially save the cost of several carpets. What’s more, when the concrete floor does become worn you can simply polish it again. 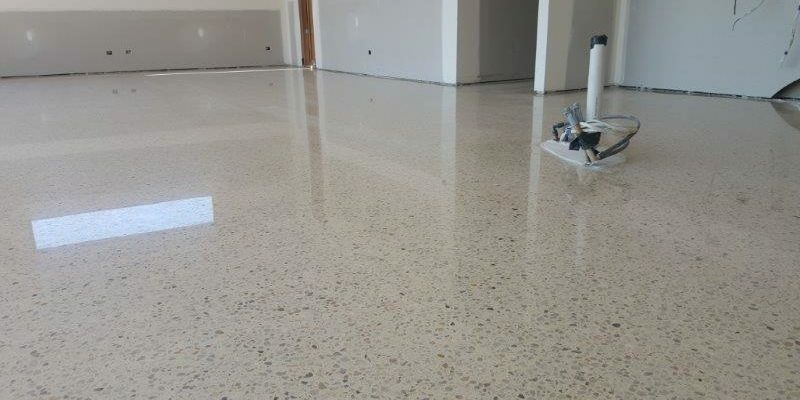 This makes polished concrete ideal for high traffic areas in your home or business. With its glossy appearance, many people mistakenly assume polished concrete is slippery. However, polishing concrete actually increases its slip resistance. Additives used in the polishing process can further improve slip resistance if required, and polished concrete performs favourably compared to alternatives such as marble flooring. Optimum slip resistance does rely on regular cleaning to avoid the build-up of contaminants, but polished concrete is very easy to clean. Businesses and homeowners who are seeking environmentally-friendly options for their home often dismiss concrete, but it is often the best flooring choice for the environment. 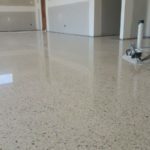 The reason for this is that polished concrete flooring isn’t using extra materials – it’s making use of the existing foundation and additional materials are not required. Additionally, the finished floor is long lasting, so won’t need further work for many years, and is easy to clean, while will reduce the need for strong cleaning chemicals. And because it’s highly-reflective, it can even lower the amount of lighting required in the room. While polished concrete will require regular maintenance, the effort required to keep it clean is minimal compared to most other floorings. In most cases, a damp mop will be all that is required to keep it clear. 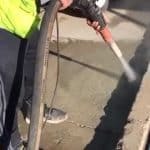 Are you considering concrete polishing for your business or home? Call Kwikcut on 0431 055 154 or contact us online for your free quote or for buying advice. Wet sandblasting is an excellent alternative to traditional sandblasting. It’s highly effective and very efficient at smoothing surfaces by removing rust, paint, stains, or any unwanted material. Moreover, because water is used, wet sandblasting does not create environmental pollution. Plus, it’s dust-free, and all foreign material removed by blasting is rinsed and flushed out by the jet of water. No wonder it’s quickly becoming one of our most popular services in Perth WA, and even all throughout Australia. Sandblasting provides a similar effect to that of using sandpaper, but it can clean and smooth a surface much faster than you would by hand. It can reach corners and crevices that you can’t when doing manual labour. The purpose of sandblasting is to restore and preserve the freshness of certain materials, giving them a brand new look. How does it work? Water and abrasive material are mixed to create an abrasive spray. This mixture is blasted on the surface, breaking away all undesired coating corrosion or other undesirable substances to create desired finish. Wet sandblasting is very versatile as well. The equipment can be used with different grit sizes. Baking soda or plastic pellets may also be used. The higher the grit size used, the more abrasive the sandblasting action will be. Each media then provides a clear finish on the surface. Where can wet sandblasting be applied? We consider every client as VIP for your satisfaction is our priority. We are your best choice when it comes to wet sandblasting. We offer you high quality, professional service for we are fully trained, licensed, and experts at what we do. “The WHS Regulations require a person conducting a business or undertaking to ‘manage risks’ associated with specific hazards, including noise, hazardous chemicals, plant and electricity. You’re always welcome to contact us for free estimates. Our customer support is willing to address your concerns round the clock. If wet sandblasting is what you need, you can trust us at Kwikcut to provide you with the best service for your blasting needs. We offer customer support 24/7.